If you were to ask Brent why he does what he does, he will also tell you that his passion for life is to help change lives for the better. He strives with everything he does to make a positive difference in the lives of people looking for a physical and psychological change. He is constantly encouraging clients to make changes in their lifestyles that will build their confidence to reach their wellness goals. My clients tell me that my ability to empathize and understand their day to day mental barriers is what makes me different than other personal trainers. I’ve built my business by meeting new people and coaching them to create a road map of success to overcome their challenges and change their mental state. Brent grew up on a farm in South Eastern NE, where he graduated with only nineteen in his class. He was a four sport athlete and was always involved in community activities. Brent attended Hastings College and had a successful career playing football and running track. While playing two sports and working multiple jobs, Brent graduated with a major in Psychology and Exercise Science with a Minor in Coaching. Soon he would go on to play Arena Football, first with the Lincoln Capitols and ending with the Omaha Beef. After taking eight years off , in 2014 he revisited arena football and played one final season with the Omaha Beef. Brent had an amazing experience getting to put the pads on one more time fulfilling a lifelong dream. After moving to Omaha in 2005, Brent worked as a personal trainer at 24 Hour Fitness for over three years. After seeing success in the fitness industry as a personal trainer, he decided to branch off and start training as an individual contractor. He found out very quickly the joys and passion of running his own business and in 2009 opened Kosama, eventually opening an additional two more in Omaha. During his 2 1/2 year tenure at Kosama, he was co-champion of the 2011 Dancing with the Omaha stars. Later he decided to part ways with Kosama and open his own facility, Dynamic Fitness in Millard off L Street. Brent is very aware of the struggles young girls face with body image and beauty. 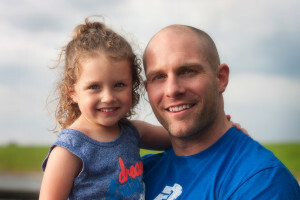 As a father to one daughter and step-father to a teenage daughter, Brent will focus on activities and training that not only encourage the girls to see exercise as a lifestyle but show them it’s not about the size or shape of your body, it’s about being the healthiest you can be and feeling wonderful and energetic all the time. Brent will show the girls proper warm up’s, correct stances and give them routines they can continue to work on long after camp is over. Brent is one of the most energetic and fun fitness instructors in Omaha, NE and will have the girls laughing and smiling through the entire camp!